Mosses grow naturally in most temperate areas of the world. or late afternoon. Some species grow well in extremely deep shade. Mosses thrive in moist, average soil. Most mosses will survive periods of drought and quickly regenerate once water becomes available again. As a group, they withstand heat and cold, grow slowly and live a long time. Like ferns, mosses grow from spores. The spores develop green threadlike branches called protonema, rather than true roots. and then eventually develop the tiny flat leaves. Thousands of these plants will bunch together to make a single patch of moss. The protonema serve primarily to anchor the moss to the growing surface. Mosses obtain all their nutrients from the air rather than the soil, which is why it is able to grow on rocks! in a wide range of rich colors, fine textures and unique appearances. and are a low-maintenance alternative to grass lawns. 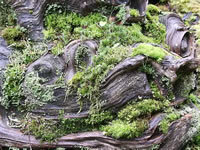 Mosses will grow on rocks, between paving stones, over logs, in soil, or any shady spot where other plants won't grow. The compact nature and slow growth of many mosses make them very usable for creating a beautiful indoor landscape in a terrarium! There are four factors that will determine your success or failure at growing moss in your landscape. Moss requires acid soil, shading, sufficient moisture, and humidity. Mosses prefer acidic soils with a pH between 5.0 and 6.0. They will probably not survive if the pH is higher than 6.5! The pH can be adjusted by the addition of sulfur (liquid or granular) or peat moss to the soil prior to planting. to intensify the color of the moss but direct, hot afternoon sun will burn it. Very few mosses will survive in full sun. The ideal growing locations are northern or eastern facing slopes or wooded areas. When choosing the planting area, be sure to consider the sun's location during all four seasons. Once established, moss will tolerate periods of drought, but it prefers constant moisture. for at least the first three weeks following transplanting. Because moss obtains its nutrients from the air, humidity is very important, but it is very hard to control. If the area is kept moist enough there will naturally be a certain amount of humidity in the growing zone. but the best method is probably to install an automated misting system. Moss plants need a firm soil bed rather than loose, fluffy soil, so if the area has been cultivated recently it should be tamped down lightly prior to laying your moss. Remove any debris, plants or leaves (moss doesn't like compost). If you want to grow your moss on a rock or log, mix up some regular old mud and spread it on the surface you want to cover before pressing the moss into place. Water regularly and thoroughly for the first 3 weeks. Unfortunately, at this time there are not many different types of moss available for sale. a strip from your own or a neighbor's woods (With their permission, of course!). It is best to remove the moss attached to a layer of the material it is already growing on to avoid excess damage to the protonema. I use a square shovel to cut the edges of the patch I am after, then try to scoop an inch of soil with the moss. 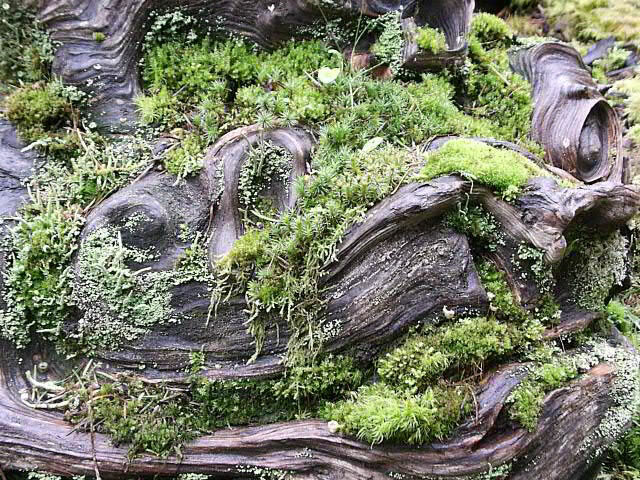 Mosses which grow on rotting wood will most likely require a rotting wood surface to survive. If possible, remove it still attached to the wood or gather some of the rotted material for the planting area. If all else fails it will probably grow for you on packed garden bark mulch. Remove moss from rocks carefully, with a wide putty knife. Take a clump of healthy moss and crumble it into your blender. Paint the mixture onto rocks, pots or statuary, or simply pour it on the ground wherever you'd like your moss to grow!